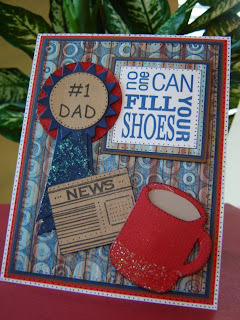 Cards by America: No One Can Fill Your Shoes Dad! No One Can Fill Your Shoes Dad! This card's base is Designer striped paper that was ran through the Circles Cuttlebiug Folder with ink for that negative side inking and embossing effect challenge. I used my CTMH stamps for the sentiment. This would make a great Father's Day Card. Dont you think?